Galveston Beaches and Galveston Seawall hotels. Top Galveston Beaches -The Stewart beach and the Apffel park are top vacation spots. Other beaches are interesting . The Crystal beach at Bolivar Island is an exception. It is not in the best shape due to the last hurricane that swept through. On the far east side of the Galveston wall is the Apffel Park also called East Beach Park. 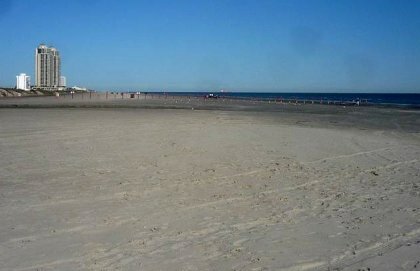 Then comes the crowded and popular Stewart beach which is the most frequented beach by tourists who come to Galveston. The next beach that comes after Stewart is the Seawall Beach. It occupies the central part of the seawall. The beach stretches 4 miles from the West side of the Wall to the East side. Many Galveston hotels are very close to the seawall beach. Just a little after the the seawall on the west side, there are two small beaches close to each other (Beach Pocket #1 and #2). The west end of the seawall to Pointe West is about 25 miles. The road that goes there is called Termini San Luis Pass Rd. There are numerous beaches along this road. Three miles down the road, are Palm beach and Pirate beach in a clean beautiful neighborhood. In between all the beaches, there are numerous small neighborhood beaches with names but the most prominent ones are the ones mentioned. A 2 mile drive through the Galveston State Park leads to another popular beach called Jamaica beach. This is a place to visit. A couple of miles ahead is the Indian beach. A sandy beach for laid back vacationers. After that there is a vast West End beach that goes miles and miles toward Pointe West, an exclusively excellent vacation spot to be. View the Galveston map for more insight.